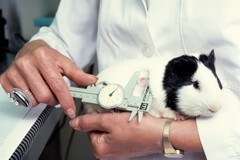 An experimental guinea pig being held by a technician. Only the technician's hands and the animal are visible. The technician measures the size of a reaction of the animal due to a recent injection.